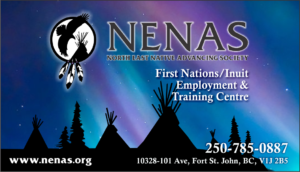 The North East Native Advancing Society (NENAS) services the second largest geographic area in BC. NENAS was incorporated under the Society Act in 1990 as a coordinating group under the North East Aboriginal Management Board working in collaboration with Human Resources and Skills Development Canada (HRSDC). As programming evolved, the Society adapted in 1996 to become a Regional Bilateral Agreement holder, and again in 1999 to emerge as an Aboriginal Human Resource Development Agreement (AHRDA) holder. NENAS conducts between 500-1000 client interventions on a yearly basis. These interventions were conducted in the following areas: Skills Enhancement, Job Search, Employment Maintenance and Career Decision Making. In 2005-2006 the interventions included: (42%) Job Searches, (35%) Skills Enhancement, (15%) Employment Maintenance and (8%) Career Decision Making. The following year, 2006-2007, the interventions conducted included: (47%) Skills Enhancement, (34%) Job Search, (11 %) Employment Maintenance and (8%) Career Decision Making. The number of interventions clearly indicates the amount of work and support that NENAS provides to the Aboriginal population of north eastern British Columbia. In recent years the NENAS administration had evolved and began to utilize the teachings of the Medicine Wheel to deliver culturally appropriate programming. The Medicine Wheel of Life is inclusive of all individuals within the family circle. To reflect the teachings of the Medicine Wheel of Life NENAS staff have worked towards including all family groups into NENAS programming: infants, youth, adults and Elders. By utilizing holistic programming clients are served in a culturally relevant manner. NENAS also utilizes the Holistic Medicine Wheel to provide culturally relevant programming to their clientele. The Holistic Medicine Wheel includes the four quadrants that make up an individual. The four quadrants that make up an individual include: mental, emotional, physical, and spiritual (in no specific order). It is believed by Aboriginal people that for a person to be healthy and happy the four quadrants need to be in balance. For example, if a person does not exercise regularly and eat properly the physical quadrant of the individual will be out of balance and the person may suffer ill health as a result. Another example would be unhappiness and negative thoughts affecting a person’s mental quadrant. As one can see it is crucial for the four quadrants to be in balance for good health and the overall well being of an individual. By working with the four quadrants of an individual NENAS is looking at the whole person. This is the place NENAS likes to begin programming, looking at the root problems of each individual. By doing this NENAS provides meaningful interventions instead of band-aid solutions. The use of Medicine Wheels in NENAS programming assists staff in working with their clients in a safe and culturally appropriate manner. It is believed that culturally appropriate programming is the most effective method with Aboriginal clients. Culturally appropriate programming also assists NENAS in dealing with the socioeconomic problems that face First Nations communities. Almost every reserve in Canada is rampant with social problems resulting from hundreds of years of colonization. In almost every Aboriginal community across Canada one will find high rates of infant mortality, high dropout rates, lack of job opportunities, lack of econimic viability, high suicide rates, massive alcohol and drug abuse and high rates of incarceration. By utilizing culturally appropriate programming NENAS is able to create a safe place for Aboriginal people to seek services. By creating safe and culturally appropriate programming clients are more likely to utilize the services and trust the staff. We have evolved in order to obtain greater flexibility in the development of programs to meet the needs of our clients and communities. In the fall of 2000, NENAS became a registered Private Post Secondary Institute with the Private Post Secondary Commission of British Columbia. In June of 2005, NENAS became a registered Charity under the guidelines of the Canada Customs and Revenue Agency. The society has been actively involved in program development and management since its incorporation. Overall, NENAS which began as an advisory board for Employment and Immigration twenty five years ago has developed successful mechanisms for the direct delivery of training and employment services. As such, we have achieved distinction amongst our regional counterparts for returning clients to work and generating savings to Social Assistance and Employment Insurance Benefits. Our long-term goal is to establish an institute for Aboriginal Leadership and Innovation. This centre will be an extension of the community and will provide local Aboriginal focused certified training to the northeast BC region.